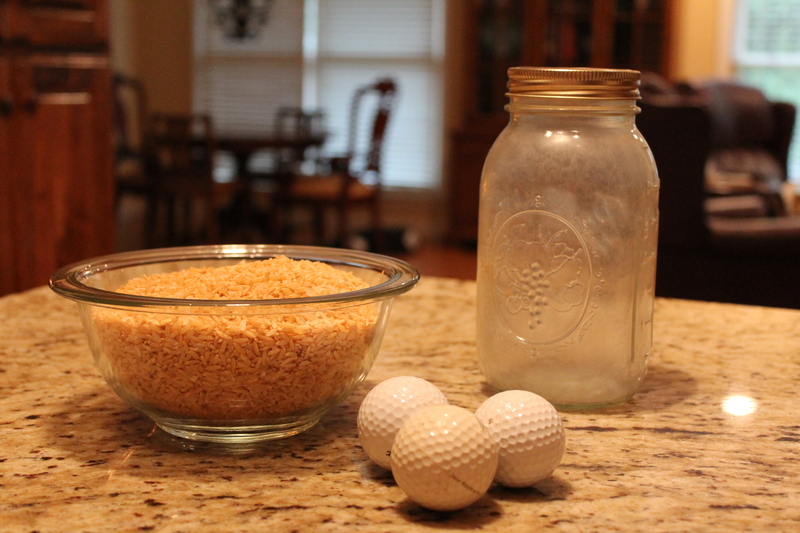 Mason jar, golf balls and rice. These items have come to symbolize the way I want to live my life. I first read about this visual in Stephen Covey’s book, Seven Habits of Highly Effective People. I have since read, heard and seen it referenced by many. I am a visual learner, so this resonated well with me. I was in my early 30’s the first time I came across the concept. I had infant twin daughters and was all about transferring my career skills to managing my home. The goal was to see how much I could get done. Life was about schedules, check lists and the race to the finish. I became extremely efficient. Although, admittedly, I had some help from a housekeeper and a two day per week sitter. Over time though the payoff for getting more done in less time seemed to dwindle. And as can happen with age, I grew in wisdom. I’d read a lot more books on the subject of managing home, and most were from a spiritual perspective. My girls were older, and much less interested in a mommy who could conquer “to do” lists, and much more interested in a mommy who jumped on the trampoline, took long walks and played with them in the bath bubbles. My heart began to long for a sense of peace, even if the laundry was piled up and the toilets had a faint ring around the bowl. Not easy for a type A, energetic person, whose identity had been wrapped up in accomplishing. I didn’t want to keep falling into the “efficiency” trap only to regret my decisions. So, I took another look at my mason jar display and my personal time management. 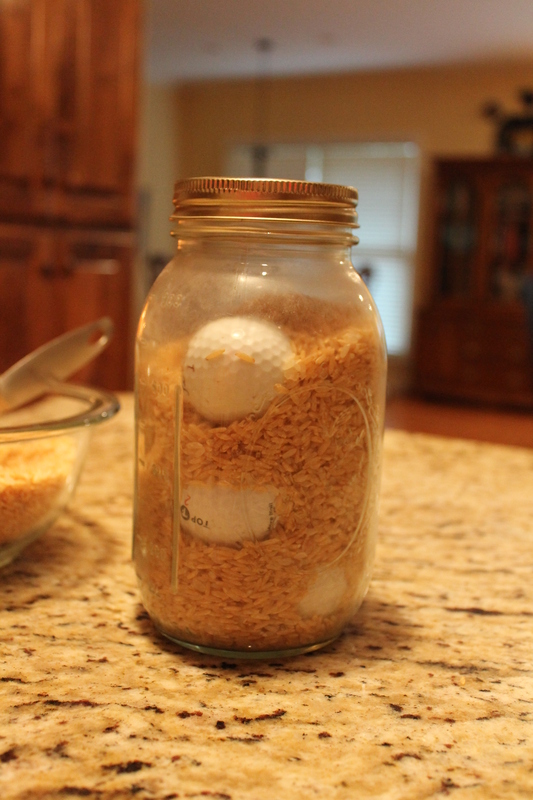 I came to some new conclusions and I now view my mason jar, golf balls and rice in a whole new way. My mason jar represents the day. We are all given 24 hours. God designed the day in two parts: day and night. At least 8 hours of our day should go to sleep/physical rejuvenation. The other 16 hours we have to do with as we please. Instead of focusing on tasks I now focus on my priorities-the “why” I get up each day. The golf balls represent my priorities or “Big Why” items. For me those are: Faith, Family, Home, Service, Work (very part time) and Friends. Yours will be different. If you aren’t sure what your “Big Why” items are I recommend the following great reads: A Woman After God’s Own Heart by Elizabeth George; 15 Minute House and Budget Manager by Emilie Barnes; The Gentle Ways of a Beautiful Woman by Anne Ortlund; A Woman’s Secret to a Balanced Life by Lysa Terkeurst and Sharon Jaynes; Family Manager by Kathy Peel; and my favorite, Ordering Your Private World by Gordon MacDonald. These “Big Why” items may change as life seasons change, but most often the top three will remain constant. I now keep a running list of “to do” items in the back of my planner for reference, but as I schedule out my week I focus less on that running list and more on seeking to do at least one thing each day related to my 6 “Big Why” items. If those 6 items are the most important to me and drive me to get out of bed each day shouldn’t they drive my planning? Each week I seek to do one thing to impact my faith, family, home, service, work and friends. Every day I seek to do something to impact my faith, family and home. Whatever task I have determined will have impact goes on my calendar in a specific time slot. For example: I get up at 5:30 a.m. every single day to grab a cup of coffee (graciously made by my husband), sit in my recliner, bible, journal and pen in hand. I read, I listen, I write and I pray. I always pray through my prayer book, Missions Mosaic prayer calendar and over my personal calendar. I can no longer begin my day in any other way. When I do, I regret it. Nothing goes right, nothing feels right and often don’t act right! And so it continues. The “Big Why” items get a specific place in a specific time slot on the daily or weekly calendar. Looking at my time in this way makes me more effective. I’m not as efficient. You’ll now find clumps of dog hair in the corners of the rooms, laundry in the sorter, and on occasion dishes in the sink (although I REALLY struggle not to stress over that one). And while I may not go to bed with a sense of total accomplishment, I go to bed with a sense of peace in lieu of regret. I know I have taken care of what matters most. Living this way though requires letting go of all the little stuff. Not that I ignore it or don’t do it. I just don’t let it drive the day. Thus the rice. It manages to get done. Once the most important items, the “Big Why” items have been assigned and taken care of, I fill in the time remaining with all those other tasks: cleaning the rings off the toilet bowl, vacuuming, getting the groceries, etc… Sometimes these tasks are the “Big Why” or enable me to do a “Big Why”. But most of the time, these are just the mundane chores of daily living for us all. The secret truly lies in doing the “Big Why” first! 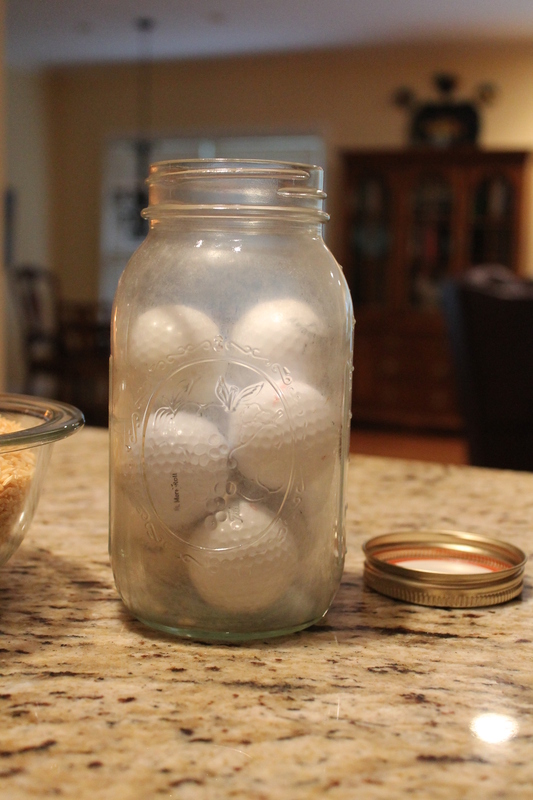 You see, if I were to put the rice (daily tasks) in the mason jar first, the golf balls (Big Why items) wouldn’t fit. Try it! So it is with our days. If we busy ourselves with the mundane, we never get to the “Big Why” items. We live our lives efficiently but risk having no effect on those around us or ourselves. That’s not living, that’s surviving. And lest you think I’m done, don’t stop here. Notice the jar again. If you take a close look you’ll see I haven’t completely filled the jar. That too, is an important part of living a more effective life. You see, interruptions will come. Elisabeth Elliott, another favorite author, calls interruptions “divine appointments”. Kids have a way of getting sick. Husbands have a way of inviting their business partners to dinner at the house. Friends have problems and need a listening ear. Death happens, births happen, and so on. If I don’t leave some space on the calendar or time in my day, I am not open to these “divine appointments”. I’ll see them only as interruptions or better yet as nuisances. I’ll become agitated and stressed. I’ll miss living. I’ll miss building relationships. Those are my lessons in effectiveness. I love my mason jar. It sits on a shelf above my little work space in the morning room. It is my daily reminder. I don’t want to survive this life. I want to live it and live it fully. I pray you’ll be encouraged by my mason jar wisdom and begin your own path to living fully. 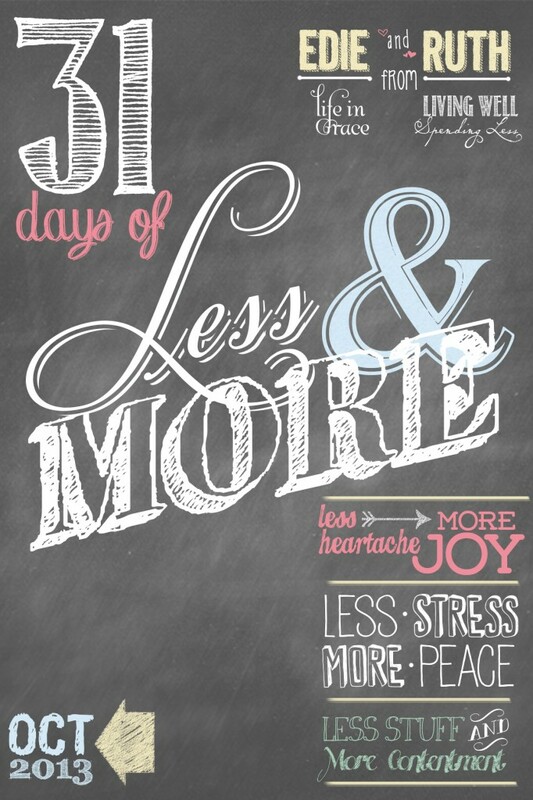 If like me, you are always seeking encouragement and some new ways of doing life I encourage you to join the 31 day challenge below at http://www.lifeingraceblog.com/2013/09/31-days-of-less-and-more-coming-to-a-blog-near-you/. ← Trapped in the Middle! We did this once at VBS with baby food jars, walnuts and rice. It’s a lesson I remember to this day. I’ve heard something similar before, but I have to say your version is much more inspirational. Hubs read it as well and agreed. I am going to print this up for both of us to have handy. Thanks for sharing. Well if the Judge liked it I am more than honored!